A must see if you have an interest in Irish culture and heritage. 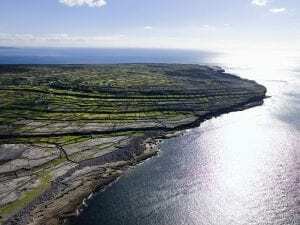 These are 3 islands located off the coast of Galway: Inis Mor; Inis Meain; and Inis Oirr, guarding the mouth of the bay. The Irish language is still widely spoken here and it represents an area which is rich in Irish culture. The most popular of all islands is Inis Mor (which translates to Big Island) and encompasses a range of different Celtic, pre-Christian and Christian monuments. A ferry leaves from Rossaveal , 40 minutes drive from Clayton Hotel Galway, to these islands each day. Take the ferry from Rossaveal to these tranquil islands.